The Wizards are playing so well you wouldn't know they're without their best player. John Wall is still out of the lineup, but Bradley Beal and Tomas Satoransky are here to rescue Washington. Welcome back to The Crossover’s NBA Power Rankings. We’re back after a week off following the All-Star break. Every team is now well into the back half of its schedule, and as the contenders separate themselves, the tankers have also fully retreated into their bunkers. The playoff race in each conference is pretty tight, with many of the top teams bunched together on both sides of the country. It should certainly be a compelling finish to the season. Let’s look at where each team stands as we head toward the homestretch. These teams are so bad! I’m sorry, but if they don’t care about the regular season, then I don’t care about showing them any attention in my power rankings. The bottom seven teams in the NBA have combined to lose 41 straight games and are engaged in the great tank-off. I would be fine if we relegated at least four of these squads into the G-League, and I’m not sure if every outfit in this group has really turned up the tank meter all the way yet. There’s plenty of bad basketball left to be played down the stretch. The Bulls have significantly cooled off since their mini midseason renaissance, and are now looking to increase their lottery odds. Chicago’s terrible start to the season means the Bulls are only three games up on the worst record in the league, but they’ll have to play a lot worse to catch the likes of Phoenix and Atlanta. The Knicks are 1–9 in their last 10 games and are quickly approaching the bottom of the league since losing Kristaps Porzingis. I just hope Michael Beasley gets bought out in time to join a contender. This team doesn’t quite make sense at the moment, but you know what, they’re frisky enough that they shouldn’t be lumped in with the league’s worst. Lonzo Ball has been shooting well for a couple months, and their black alternate jerseys make watching their absurd number of national TV games almost bearable. The Pistons have lost five of their last six and the Blake Griffin Effect has seemed to cool off. It’s going to be really disappointing if Detroit still doesn’t make the playoffs after reshuffling the deck at the deadline. At some point you have to wonder if the sword will fall down on Stan Van Gundy. The Heatles reunion tour is sputtering a bit. Miami is only 2–8 in its last 10 games, as the team has started to lose all the close games it was winning earlier this year. A healthy Kelly Olynyk will be important for the stretch run, but Erik Spoelstra still has some work to do to find the right lineup combinations to unlock his roster’s full potential. A return to last year’s form from James Johnson would help mightily. Let’s show some love to the Hornets, who have won four in a row to avoid a full-on tank after losing four straight earlier this month. Charlotte’s infant-like ineptitude in close games looked like it would stop them from having any hope at the playoffs. But with 22 games left, the Hornets are only four games out of the eight seed in the East. Maybe they can make the last couple months interesting. The Clippers are staying right on the edge of the playoff race, entering this week only one game out of the bracket in the West. I’m going to stress this every week: Doc Rivers deserves more consideration for the Coach of the Year. I’m not even worried about the Avery Bradley injury because of the emergence of [squints]...Tyrone Wallace! The Butler injury is an absolute killer. The Wolves play like a top-five team in the league with Butler on the court, and a bottom-five team without him. Minnesota already had issues with depth, and losing its star player for any amount of time is going to have dire consequences. It’s unfair to blame the Butler injury all on Tom Thibodeau...but at some point Thibs needs to look in the mirror and think about how many minutes he plays his starters. And as the head of basketball ops, Thibs has only himself to blame for not having anyone to go to on the bench. I’m tempted to leave the Thunder at No. 15 for the rest of the season because they cancel out all their good wins with baffling losses. Saturday’s blowout loss to the Warriors was a sobering reminder of the gap between OKC and Golden State. If Sam Presti can’t find another wing on the buyout market, this team may find itself in a struggle just to get out of the first round. The Bucks have big games coming up in the next seven days, with matchups against the Wizards, Pacers and 76ers all on the docket. With the tight nature of the East, a streak of wins against that competition could have Milwaukee in the top half of the playoff bracket. Not bad for a team that fired its coach midseason. The Spurs had lost six of seven before their win over the Cavaliers on Sunday. Pop rewards our faith every season, but this has been a particularly dull year for the franchise. This trying period will have all been worth it though if Kawhi mystery is solved and he returns in terminator mode and the Spurs upset someone in the first round. This is one of my favorite stats of the season: The 76ers’ second most-used lineup of the season has played only 86 minutes together. Their most used has played 426. The Nuggets have been hot this month. They can’t quite figure out the Rockets, but the pieces are falling into place in Denver, especially with Paul Millsap returning to practice. The Pelicans have won five in a row, and are staying afloat without Boogie Cousins. The scheduled has helped, but so has an absurd stretch from Anthony Davis. Nikola Mirotic was a nice pickup at the deadline, and it’s also fun to see Emeka Okafor getting some playing time here, even if it’s worrisome to think about how much the team is counting on him. 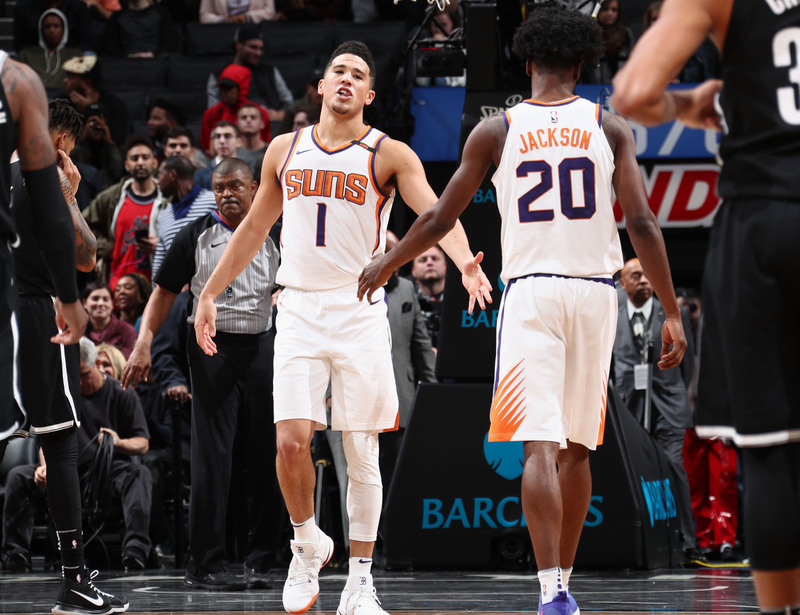 As long as Davis keeps playing like the all-universe talent that he is, this team won’t go away quietly. With the Butler injury in Minnesota and the malaise in San Antonio, the Blazers have a realistic path toward the third seed in the Western Conference. Portland entered this week only a game and a half out. The sleeper in the East. The Pacers have won four in a row, and they play two cupcakes in the Mavs and Hawks this week. Indiana has been legit for much of the season—did you know the Pacers have the ninth-best net rating in the league? And as if things weren’t going well enough for this franchise, Victor Oladipo recently received the Lee Jenkins treatment. The Cavs have lost two of three since the All-Star break, but I’m giving them one more honeymoon week for the new pieces to gel around LeBron. As long as the expectations here are Finals or bust, the most will always be demanded of no matter the group on the floor. The Jazz are back on track after Portland ended their 10-game winning streak. This is a big week for Utah with matchups against Houston and Minnesota on the schedule. If the Wolves can’t hang on without Butler, the Jazz may end up being the biggest beneficiaries. Break up the Wizards! Give me your John Wall trades! The Wiz are playing their best basketball of the year, and it’s all happening without their star point guard. Washington has wins over the Pacers, Raptors, Cavs and 76ers this month. Tomas Satoransky has been a revelation, sliding into Wall’s spot in the starting lineup and giving the team heroic minutes. The Sato-Beal-Porter-Morris-Gortat five-man unit has a net rating of 15.2. 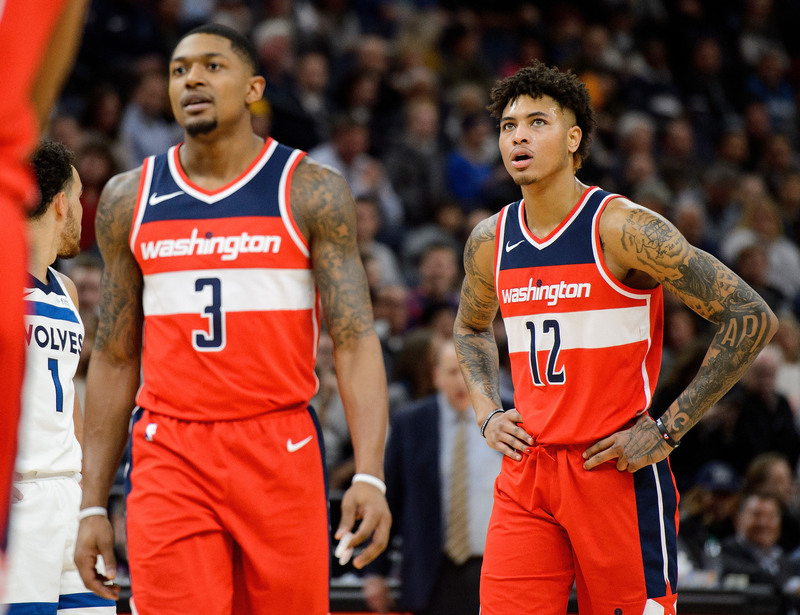 Meanwhile, the Sato-Beal-Porter-Oubre-Gortat group has a 22.0 net rating. Satoransky may not have the same impact playing with other bench players once Wall returns, but he’s proven he can be an asset to this team. The Wizards will really be tested over the next month, however. From now through March 23, Washington will only play teams who are currently in the top eight of each conference. Greg Monroe hasn’t exactly been the answer to Boston’s offensive woes, as the Celtics—while still a great team—have looked just the slightest bit creaky over the past month. I’m not sure I could pick Boston over Toronto or Cleveland in a playoff series right now. The Raptors keep rolling, but more importantly, I really want to commend DeMar DeRozan for speaking out about his battles with depression. That’s not an easy thing to admit, let alone discuss publicly. DeMar is having a great season, and we’re sending positive vibes his way. Let Javale McGee coach against the Knicks if only for the Enes Kanter reaction. The Warriors are seemingly never firing on all cylinders but they are still right there with Houston at the top of the league. The difference is the Rockets actually seem to care. James Harden is the MVP if the season ended today. Will Jimmy Butler's Knee Injury Doom Wolves' Playoff Hopes?